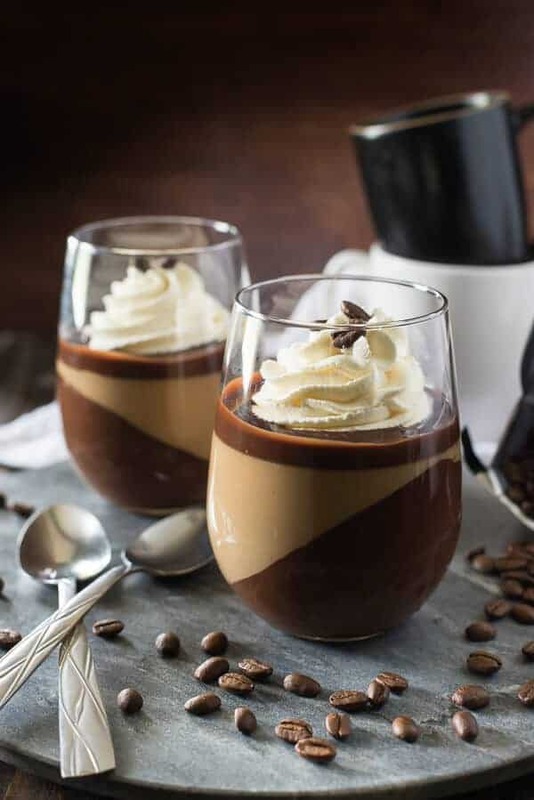 Mocha Panna Cotta with Mascarpone Cream – Layer upon layer of chocolate, coffee, and cream makes for one rich, delicious java dessert that you’ll want to share with everyone! I am totally one of those people that could drink coffee all day. At this point in my caffeine-driven life, I’m convinced that it’s all a lie. A placebo effect that convinces busy, sleep-deprived workaholics (like moi) that they can conquer the world…one cup at a time. For me, coffee just fills the void that I wish was my snooze button. 5 days a week, my morning is the same: stumbling to the old Keurig long before the sun has even thought about coming up, eyes half open, with the dog whining at the back door to be let out. Coffee first, then life. But for me it’s not necessarily the caffeine, but the routine. 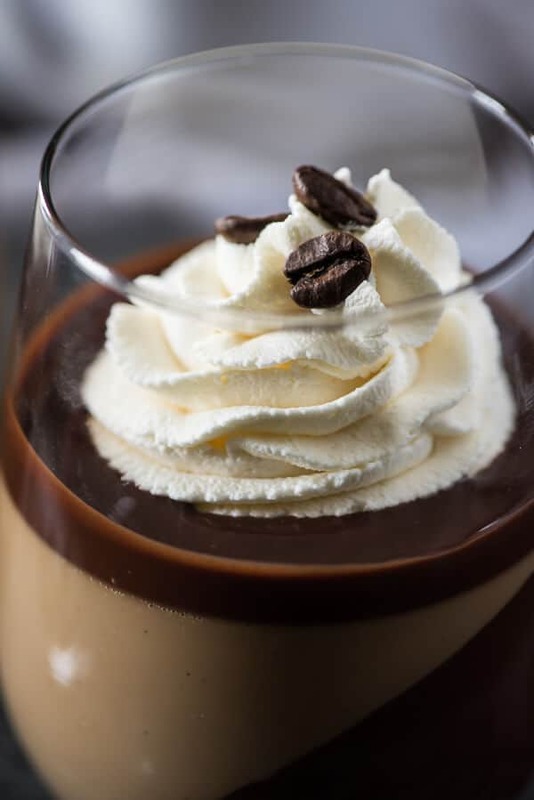 JUST TAKE ME TO THE MOCHA PANNA COTTA WITH MASCARPONE CREAM ALREADY! 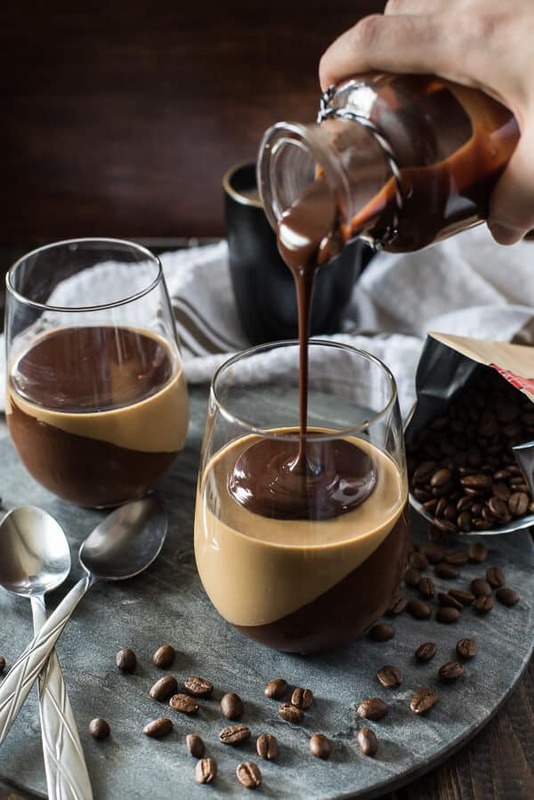 If you’d rather skip my (pretty darn helpful) tips and tricks, essential cooking info, and similar recipe ideas – and get straight to this deliciously easy panna cotta recipe, just scroll right on down to the bottom of the page where you can find the printable recipe card! As a kid, I could never understand what Nana saw in drinking coffee. Aside from the scent of the grounds as you open the bag (which I’m pretty sure we are predestined as humans to love,) the appeal of the bitter brown liquid was lost on me. Especially since she would make a kettle-full and take two days to drink the whole thing, simply microwaving a cup at a time. She was one of those people who drank 3-4 cups a day, at all hours, and she lived to be 90. Plus, she had no health problems until her last year with us. The back and forth of whether or not caffeine affects heart health loses credibility when you look at the full, vigorous life she led. This past Friday, I participated in a local American Heart Association Heart Walk (around Daytona International Speedway) with people representing various small and large businesses in my area. I, of course, walked with my team from Publix, but I was walking for my Papa. If you’re a regular reader, you know all about Nana, but I don’t talk about Papa much. I was very young when he passed away in 1989 after his eighth and final heart attack, but my memories of him are vivid. He had an incredibly full head of hair for a man in his late 70s, and he was always dressed well. He forever smelled like Old Spice. He drank buttermilk from the carton and ate fried bologna and onion sandwiches like it was his job. He read to me every night, more than one story if I asked him to. He built the cabinets in my kitchen with his own two hands, and while I can’t stand Formica, I can’t bear to change them. And oh man, did he love his family. Despite how young I was, losing my father figure was incredibly impactful. I didn’t know him nearly as well as I grew to know Nana, but I still miss him every day, and blow a kiss at the photo I have of him by my front door on my way out. 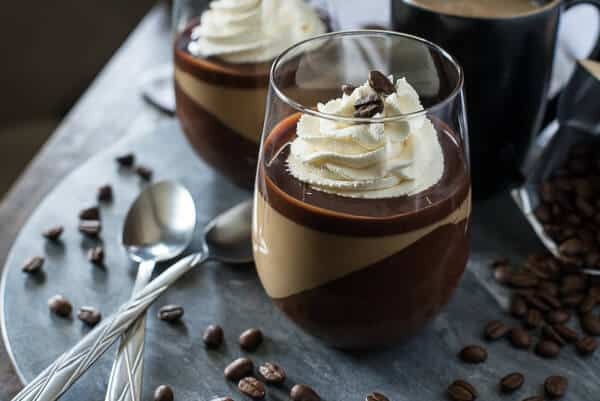 This week, the fun folks of Sunday Supper are sharing their favorite coffee-based recipes, so of course, I couldn’t pass up showing off one of my favorite desserts of all time. 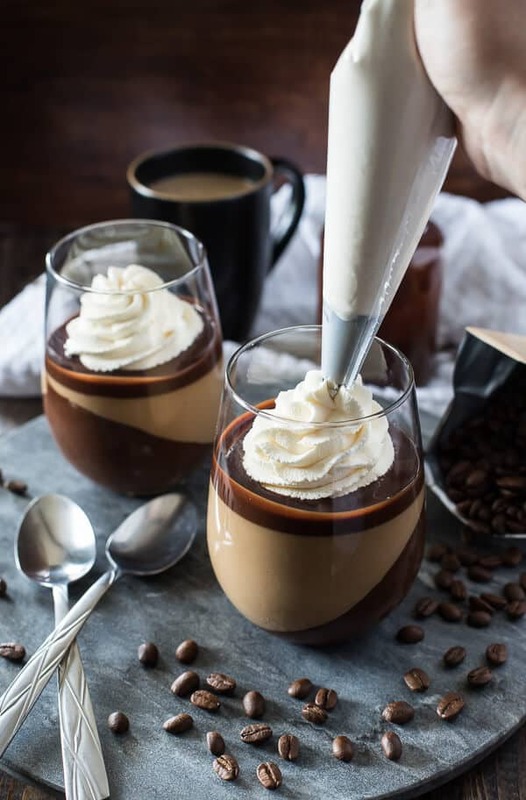 It’s already the most beautiful blend of cream and gelatin, and then…spiking it with espresso? And layering it over dark chocolate Kahlua mousse?! Oy. Hold me. 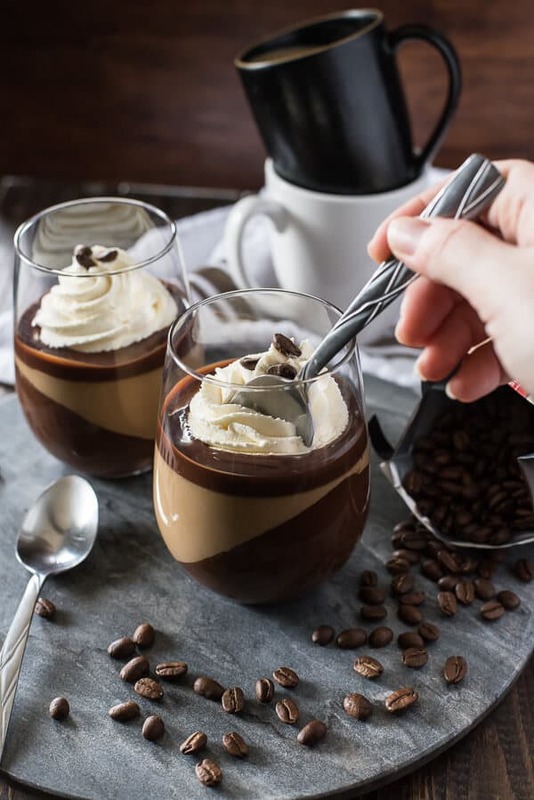 Pouring some warm chocolate ganache to soften the top of the panna cotta juuust a little bit, then topping it all off with a sweet mascarpone whipped cream makes this dessert complete. The various textures and flavors are a decadent combo that can dull that evening coffee ache that sometimes hits. If you decide to make this recipe, trust me when I say a wine glass full like the ones in my photos will require two or three spoons to finish it off – it’s incredibly rich, so it is completely acceptable (and probably recommended!) to make smaller glasses to feed more people their own serving. 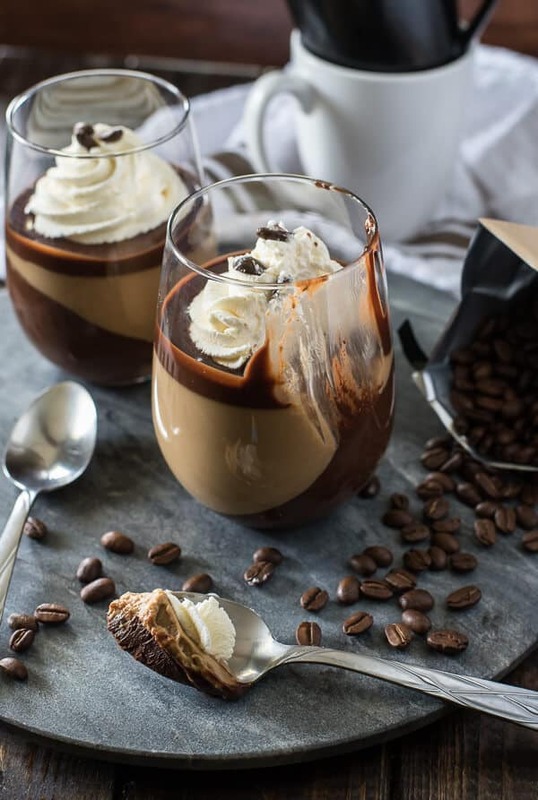 LOOKING FOR MORE COFFEE FLAVORED DESSERT RECIPES? 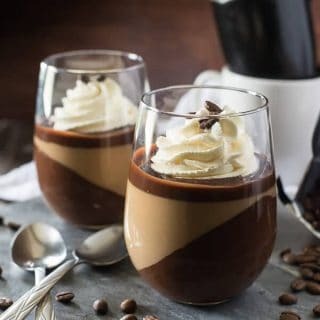 Mocha Panna Cotta with Mascarpone Cream - Layer upon layer of chocolate, coffee, and cream makes for one rich, delicious java dessert that you'll want to share with everyone! Place the cream, chocolate and honey in a medium saucepan set over medium-low heat. Stir until smooth and incorporated. Whisk in the cocoa powder and Kahlua. Place 3-4 wine glasses at a slant in loaf pans. Carefully pour the chocolate mixture into them. Refrigerate for 2-3 hours until set. Place ¼ cup of milk in a small shallow bowl and set it in a larger bowl filled with hot water. Sprinkle the gelatin over the milk, allowing gelatin to melt. 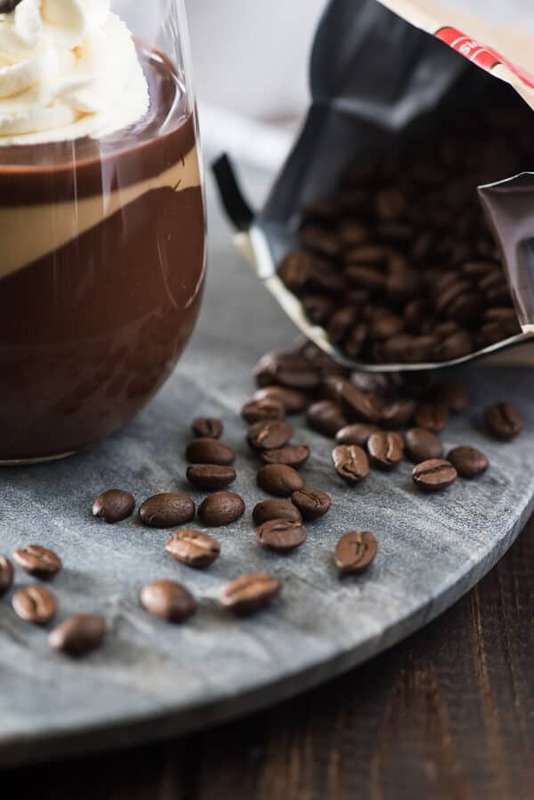 In a medium saucepan set over low heat, bring the remaining ¼ cup of milk, heavy cream, espresso, and sugar to a low boil, and simmer for about 5 minutes. Remove coffee-cream mixture from heat and whisk in the vanilla and gelatin until combined. Allow the mixture to come to room temperature, then pour over the set chocolate cream. Pour ganache over set panna cotta just before serving. Combine all ingredients in a medium bowl. Using a hand mixer, whip until medium peaks form. 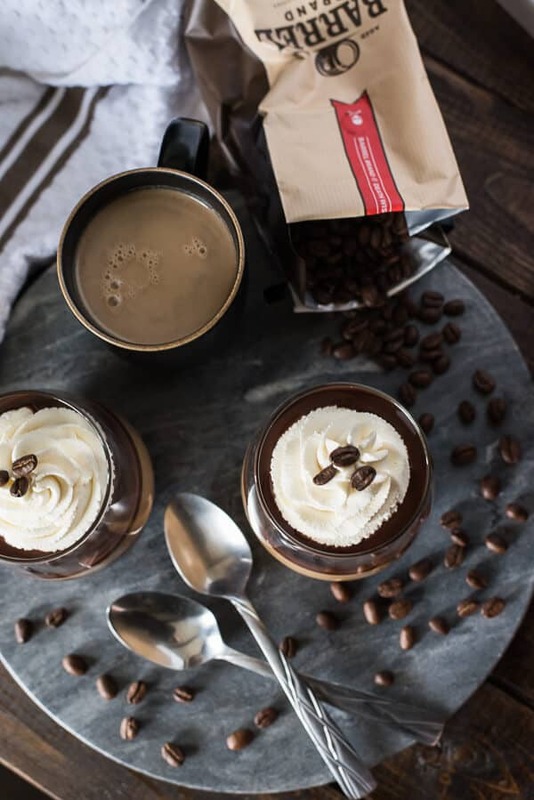 Pipe or spoon prepared mascarpone cream over ganache before serving, then garnish with whole coffee beans. Enjoy! Adapted from Passionate About Baking. Coffee, coffee everywhere – in more than 40 recipes, as a matter of fact, all from my fellow #SundaySupper Tastemakers! What a stunning dessert! You never disappoint!!! Thanks for sharing your beautiful tribute to your Papa. Your dessert is absolutely stunning, I wouldn’t want to dive a spoon into it!! What sets the chocolate in the first layer? As in the bottom layer? This was a hit with my family and co-workers! They LOVE it -so much that Iits been requested twice for me to make it again! Thank you…. I’m SO happy to hear this, Heide! It’s definitely a tasty spin on panna cotta – that mascarpone cream is dreamy. 🙂 Thanks so much for stopping by! My chocolate didn’t thicken it was very runny/soupy not sure why was it because I didn’t have any Heavy whipping cream? I Let it sit over night in the fridge before I put the coffee part on and the only thing that was remotely thick was a small skin on top and that part was really thick. When I don’t I just use whole milk with melted butter and it works every time but this one hummm…what to do Don’t know If I want to make it again. It looks good which is why I tried it in the first place but if it will be that why next time why even bother. Rather Disappointed!! Katie, I’m sorry to hear that you had trouble, but I would definitely say it was the lack of heavy cream. Duplicating the butter fat to liquid ratio is difficult in a heavy cream substitute since milk is thinner than cream, and you’ll also need to reduce the amount of milk you use since it’s so much thinner. If you try again but don’t plan on buying heavy cream (though I really recommend you do since it’s used in every element of this recipe), use 3/4 cup milk + 1/3 cup butter for every 1 cup of heavy cream and make sure you simmer & melt them together on the stovetop so it properly emulsifies, then remove it from the heat and pour it over the chocolate. Let it sit for about 5 minutes, then whisk in the honey, cocoa, and Kahlua. I’ve made this recipe successfully multiple times and have never had an issue, but I always have heavy cream on hand. I do hope you give it another shot because it is SO good! This dessert is absolutely stunning!!! I saw your pin in my suggested pins queue in Tailwind, and I just had to check it out! !